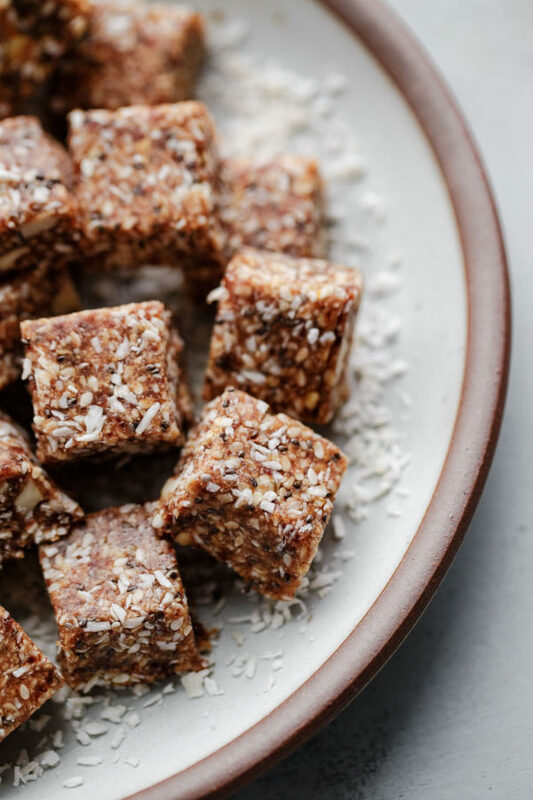 These no bake energy bites are packed with flavor and texture from dates, cashews, shredded coconut, sesame and chia seeds, and orange zest. 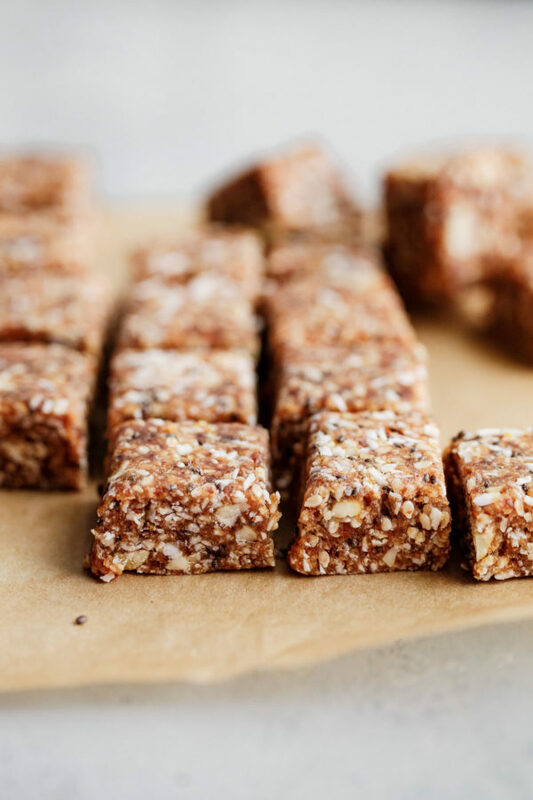 Naturally sweetened, they make a great travel or pre or post-workout snack. Gluten free, dairy free, and paleo friendly. 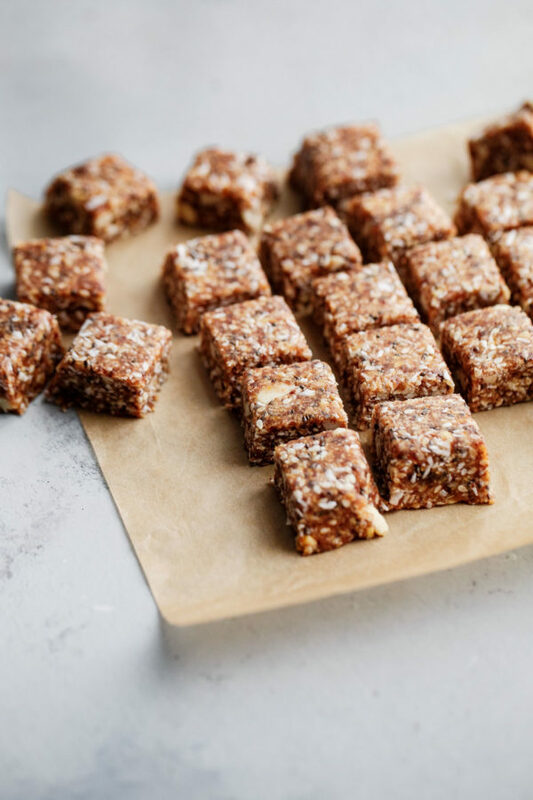 I’m so excited to bring you the recipe for these no bake energy bites! I know, I know. Energy bites are not exactly groundbreaking news on the internet, but these might be the best energy bites that I’ve ever had. 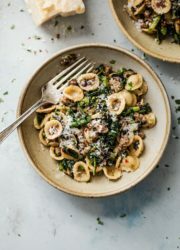 The recipe was inspired by a tiny health food store called The Grainery in Baraboo, Wisconsin that Connor and I visited on a weekend trip a few weeks ago. We had just finished up a hike at nearby Devil’s Lake State Park and picked up some snacks for the road, including a bag of their homemade energy bites. We enjoyed them so much that I vowed right then and there to recreate them for you once I got back. A few details (including freshly grated orange zest!) 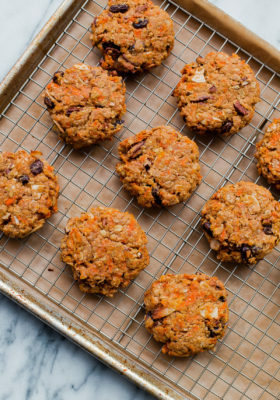 make these energy bites particularly delicious, and make them stand out from most basic energy ball recipes. First, these energy bites are loaded (and I mean, loaded) with texture. You get a lot of varying texture in each bite, which I absolutely love. 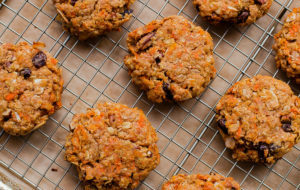 A lot of energy ball recipes contain rolled oats or nut butters as ingredients or binders, and these are not those kind of energy bites. If you’re looking for a comparison, I would say that these most resemble Larabars, but have significantly better flavor and texture. Instead of rolling the mixture into balls, we’ll be pressing the ‘dough’ into a standard loaf pan, allowing the mixture to chill in the fridge for an hour, and slicing them into small bites. I personally find that most energy balls are way too big. This also eliminates the mess and step of scooping and rolling them by hand, and allows them to chill and firm up faster. It also allows you to tailor them to whatever size you wish! You could cut some into ‘bars’ and some into squares. My instructions call for cutting them into 1-inch square pieces, which in my humble opinion, is the ideal size for an energy bite. But feel free to adjust to your liking! 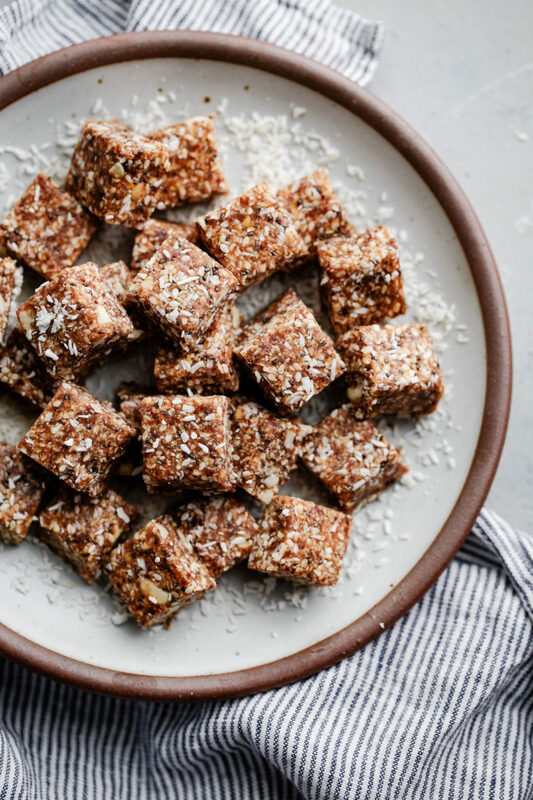 These energy bites are made with a base of pitted Medjool dates, whole cashews, raisins (if you despise raisins, you can use other dried fruit, such as tart cherries; see substitution notes in the recipe), and unsweetened shredded coconut. 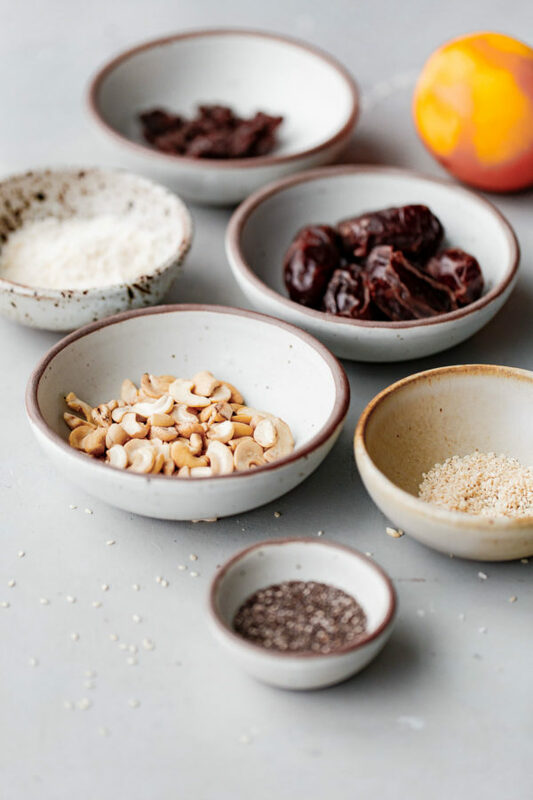 These ingredients get pulsed together in the food processor, along with a pinch of kosher salt and freshly grated orange zest (it adds such a lovely brightness and complements the coconut so nicely!). It will begin to clump and come together after about 30 seconds or so. 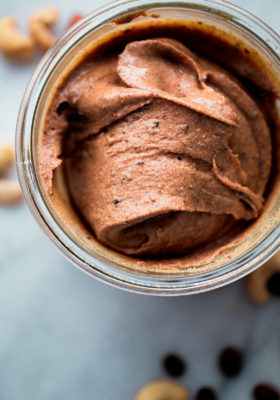 Using a food processor allows you to incorporate all of the main flavor evenly, but results in a relatively smooth, tacky mixture without a lot of texture. The trick for making a well-textured energy bite is reserving and mixing in additional ingredients by hand. 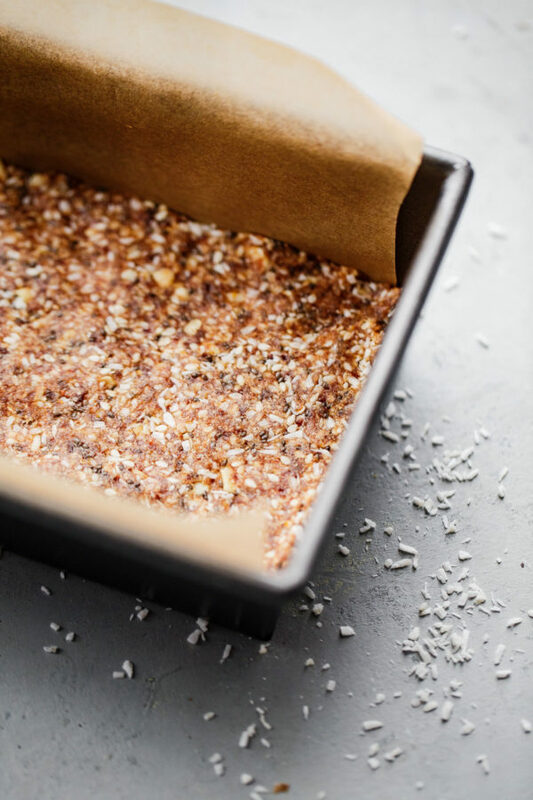 For this recipe, we’ll be mixing in chopped cashews and more unsweetened shredded coconut, as well as a generous amount of sesame seeds and chia seeds. You won’t be able to taste the sesame or chia seeds, but they add so much great and varying sized texture throughout. Look at that texture! A little chewy, a little crunchy. Perfection. What do these energy bites taste like? Since these energy bites are made with dates, they are sweet. I love to have one as a quick afternoon snack or pre or post-workout snack. 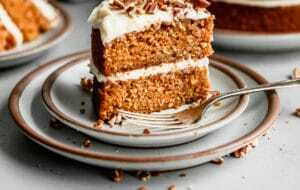 The dominant flavor is unsweetened coconut, dates, cashews, and orange zest. 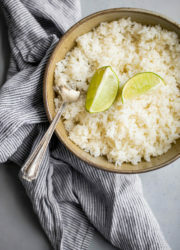 The coconut meat almost gives them a tropical flavor. I just love it. Once chilled, they are lightly firm, yet easy to bite into, without being overly soft. 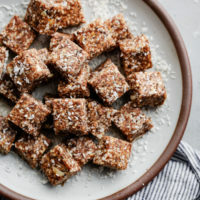 Tips for Success: You’ll want to use the smaller, more desiccated shredded coconut, as opposed to the fluffy, moist variety for these energy bites. 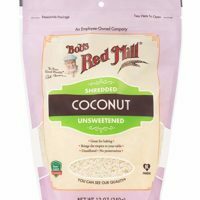 I highly recommend Bob’s Red Mill brand (affiliate link). 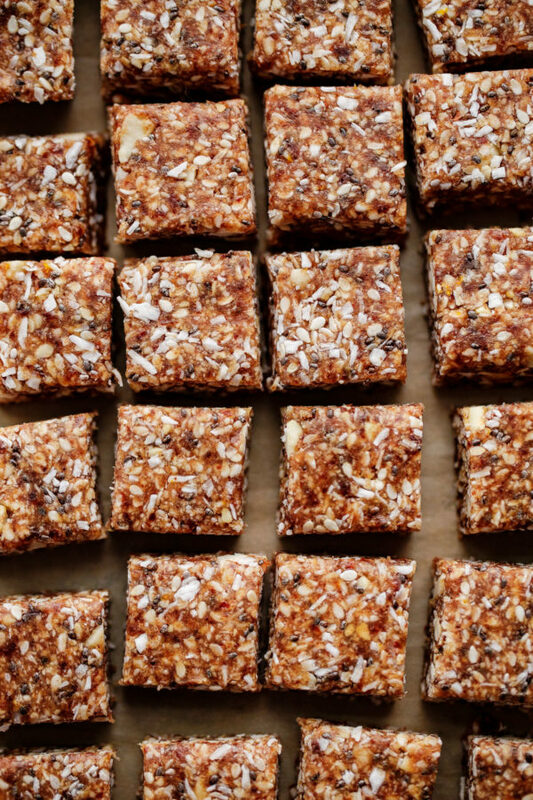 Homemade energy bites can be stored in a covered container in the fridge for up to two weeks or longer (I like to separate any layers with parchment paper; or use another sprinkle of unsweetened coconut on the bottom of the container and between layers, which helps provide any sticking!). 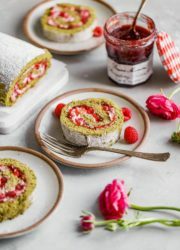 While these bites can be taken with you for travel, etc., (they don’t contain any temperature sensitive ingredients) they will be much softer at room temperature and I prefer the texture when they’re slightly chilled. They can also be frozen for up to 3 months; simply thaw in the refrigerate before eating. Hope you love them as much as we do! Place the pitted dates in the bowl of a large food processor. 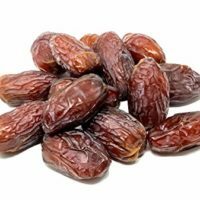 [*Note: If your whole dates are hard or on the drier side, place them in a bowl, pour hot boiling water on top of them, and allow sit for 10 minutes before draining and using.] 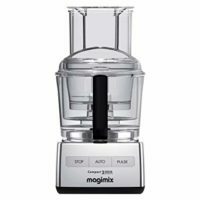 Pulse in food processor until a thick paste forms. Add 1/2 cup whole cashews, 1/3 cup shredded unsweetened coconut, 1/4 cup raisins, orange zest, and salt. Pulse mixture continuously until it forms large clumps and just starts to come together, this will take about 30 seconds or so. Transfer mixture to a medium mixing bowl. It will be thick and sticky. 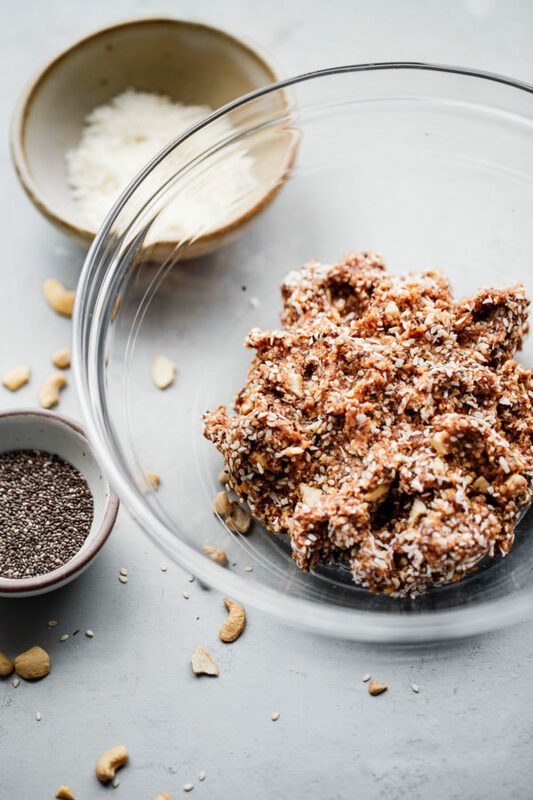 Add the remaining 1/3 chopped cashews, 1/4 cup unsweetened shredded coconut, sesame seeds, and chia seeds. Mix and press together with clean hands until all of the ingredients are incorporated evenly. The 'dough' will still be slightly tacky, but it will firm and dry slightly as it chills in the fridge. Transfer dough to a parchment lined loaf pan (9 inches long x 5 inches wide) and press into an even layer until it reaches all sides. Use the bottom of a measuring cup (or flat glass) to press and flatten the surface evenly. 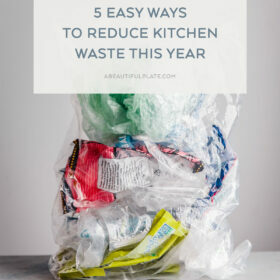 Store in a covered container in the fridge for up to two weeks or longer (separating layers with parchment paper to prevent sticking; a sprinkle of unsweetened coconut on the bottom of the container and between layers also works brilliantly for this!) for up to 2 weeks or longer. Best served chilled from the fridge. Note: While these bites can be taken with you for travel, etc., they will be much softer at room temperature and I prefer the texture when they're chilled. They can also be frozen for up to 3 months; simply thaw in the refrigerate before eating. 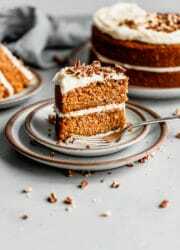 For best results and texture, use the more desiccated unsweetened shredded coconut, as opposed to the fluffy, moist variety. If you hate raisins, feel free to substitute the raisins with another dried fruit of your choice. Tart cherries would be great, and even dried figs would be delicious. These look fabulous! 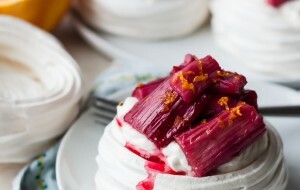 Definitely going to make these soon! Finally made these tonight and oh. My. Word. They are fabulous!!! 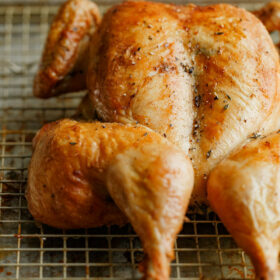 Love the texture and the orange zest is perfection! Mine have not firmed up after and hour but I dont care, they are still delicious! So thrilled to hear that! If they haven’t chilled, maybe try another hour – they definitely will chill substantially if left overnight. An hour is about the minimum, and perhaps my fridge is a touch cooler than yours. Thanks for coming back and leaving a review Bianca! This is a great snack on the go.